Click to see the regular or one-off events are taking place at Equus. We can cater for you at Equus – click here to see what we do! Click here if you need help schooling your horse. Click here for a riding getaway to remember at Equus. Adult hacks on Sundays for a minimum group of 6 people for a bargain at £20 per person. Contact Lisa for times if interested. Two adult only courses will be starting in late October for a duration of 8 weeks at a cost of £160. The courses will include a combination of lessons, hacks and horse care sessions and last for 90 minutes each. There will only be 6 places on each course and you will be asked to commit to the full 8 weeks. The Beginners/Novice Course will be held every Thursday at 2pm starting on Thursday 25th October. The Intermediate/Advanced Course will run each Tuesday at 6pm starting on Tuesday 23rd October. Despite the turn in the weather a forest or beach hack is still a great way to de-stress after a days work or just to enjoy the scenery and the outdoors (beach hacks times are obviously tide dependent). We still have great bundles available for both forest and beach hacks for a fantastically reduced price of £70 (normal priced £99). Give us a call on 07917 572154 to book any of these events. Here are the riding activities that we can offer at Equus. Most can be arranged as group or individual lessons, plus we can also tailor sessions to meet your needs if you have something specific in mind. Lessons in the School are aimed at all abilities from first sitting on a pony up to Olympic stardom! We can do private lessons where you can focus on a specific element of your riding. Or you can join a group lesson which will be more general and based on riding ability. We specifically work in small groups, no more than 5, so no-one escapes my beady eye and everyone improves. Exploring the picturesque and folklore filled Roseilse Forest all abilities can be accommodated in order to take advantage of this wonderful forest adventure. From your first time, nervous, neck grabbing individual to your more proficient, balanced rider, everyone can enjoy the amazing trails at a pace that suits them – a walk, trot, canter or exhilarating gallop. Groups are easily accommodated, plus children as young as 4 are able to go along together with family to enjoy this riding experience. At Equus, we are fortunate enough to have access to Roseilse Beach, miles of beautiful white sands, for you to enjoy. All our horses and ponies are very well behaved and controlled, so the most novice rider can enjoy the beach at a leisurely walk, or a more skilled rider can enjoy a breathtaking experience as they gallop over the sands, unencumbered and safe. You can even have a paddle in the water together. At Equus we can offer a Horse Care Package which can be taken in isolation concentrating on horse care or it can be incorporated into part of your riding lesson. This package allows you to gain experience in handling your horse from bringing it in from the field, grooming, learning how to tack up and leading your horse around to the school. It will build your confidence and enhance your connection with your horse, which will improve your riding. Schooling is offered at Equus on a short term or long term basis depending on the level of ‘ASBO’ your horse comes with! 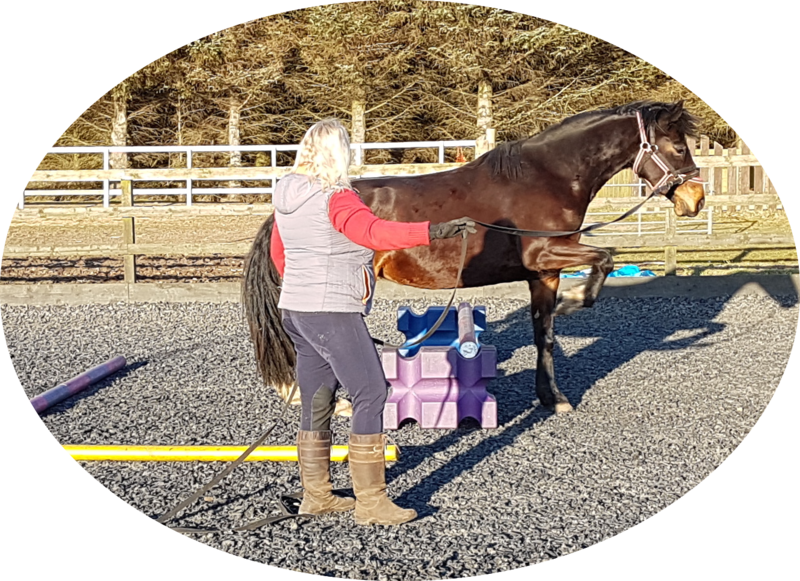 So if you are having a hard time getting your horse to accept their first saddle and bridle, or if you are struggling to get those outlines or flexions we can offer help to do this. Give Lisa a call on 07917 572154 to discuss your schooling needs. Why not join us for a riding getaway in beautiful Morayshire. We can offer a variety of riding mini-break and holiday options right here at Equus. Call Lisa on 07917 572154 to see what’s available. I come every Saturday to ride VP – its BRILLIANT! We had a wonderful forest experience on beautiful horses with friendly, welcoming guides – thank you! I have progressed from a nervous beginner to somebody who can pop a small jump with confidence.